I like to think of myself as a reasonably healthy eater. Actually, on second thought, I’m more of a reasonably “not unhealthy eater.” By that, I mean that I try to avoid too many foods that are bad for you. One of those areas that I avoid is sugary drinks like Coke and Pepsi, but also Iced Tea. I mostly stick to water. But another thing that I do is eat breakfast on most days, even if it is only two slices of toast and a glass of orange juice. I’m not normally very hungry in the mornings but I do force myself to eat something. Lately, I have discovered a new type of breakfast that tastes pretty good. Rather than eating cereal with milk, I have been eating cereal with yogurt. I take a raspberry, peach, blueberry or strawberry yogurt, empty the contents of some cereal into it and then proceed to consume the entire portion. I put it into a bowl so it’s almost like eating a normal bowl of cereal. This is something that I quite like, at least for the time being. My culinary selections change on a regular basis, but hopefully this is something that I will keep up for the longer term. The other day, I was in a bookstore like I so frequently am. And as per usual, I went to the finance and investing section and started to peruse a few books. This is my favorite section of the store although I rarely buy books anymore. I simply borrow them from the library. In addition, I think I’ve already learned a lot when it comes to finance and investing, both through reading tons of books but also through personal experience. As I was looking over the books, I came across a few by Dave Ramsey. Ramsey is a financial advice giver who has is own radio show and has written many books on the topic. More recently, he has created the Financial Peace University course which mixes some Christian doctrine in with advice on how to manage one’s money. Much of what Ramsey advises is common amongst many advisors – get term life insurance instead of whole or universal life, get a will made up, have a large rainy day fund, plan a budget and stick to it, contribute to a 401(k) and Roth IRA, and so forth. A lot of it is good advice. I picked up one of his books (I forget which one) and started to flip through it. Much of it was stuff I agreed with, but there was one thing that I thought was oversimplified and incorrect – his position on debt. The one thing that stood out was Ramsey’s position that “all debt is bad” and “there is no such thing as good debt”. Essentially, you should stay out of all debt no matter what it is – credit card, automobile, shopping cards, and so forth. In fact, you shouldn’t even have a credit card and instead pay cash (or debit) for everything. Avoid debt at all costs (ha, ha, pun intended). I can’t recall if he said this or not but ideally you should even pay cash for a house. Since this is nearly impossible for most people, his position is that it is a necessary evil to incur debt for a home purchase. My position on debt is more nuanced than Ramsey’s. I differentiate between good debt and bad debt. I believe that a person should stay out of debt in the case that cost of the debt incurred is depreciating in value or provides no incremental value. Huh? Let’s say that you wish to purchase a new automobile for $30,000 and take out a loan for that amount. The automobile is now declining in value every single day, yet the total cost of your loan still remains at $30,000 and you are making interest payments as well. Thus, the debt is secured on something that is depreciating. After you pay off all the interest it will end up taking more than $30,000 out of your pocket, it will be closer to $35,000 or $40,000. That additional five to ten thousand dollars is something you could have used to invest and increase in value and provide a richer rate of return. However, not all debt is depreciating, nor provides no incremental value. If the after-tax cost of borrowing money is less than the rate of return on that borrowed money, then the debt is good. It is debt that increases in value. Suppose you took out a $100,000 low interest loan from the Treasury Department at an interest rate of 1%. You then took all that money and put it into a high-yielding certificate of deposit that returned 3%. In this case, it is a net 2% gain and while the cost of the loan is still $100,000, the value of the money is $102,000. That is a positive net difference of 2%. So you see, not all debt is bad. If you get a positive after-tax return on the money that you borrow, then that is a scenario where debt is good. Businesses need to incur debt in order to expand. Credit card debt is bad because for the most part, the things you purchase do not go up in value. You use them once or a few times but they are not used by you to return any additional capital that you wouldn’t have already had (think restaurants, boats, expensive clothes, etc). They also have very high interest rates so even if you could use the stuff you purchase to make money, you would be hard pressed to make more than the interest rate on the card. To evaluate whether or not debt is good or bad, you need to evaluate marginal rates of return. Is a better to take out a loan on a $20,000 car? Or is it better to pay cash? Well, a car is going down in value so you should just save up the cash and pay for it all in one chunk. On the other hand, those of us with cars use them to get to work. Or we use them to shuttle around our friends and family. Or we use them to go to leisure events, or spiritual centers. So while you are waiting around for public transit while you are saving up, what’s the cost of your time? I used to go dancing in downtown Seattle on Sundays, and I would take the bus. However, getting down there would be a 15 min walk and wait to the bus stop, and then a 45 minute bus ride down there making 1 hour of travel time. On the way back, dancing would finish at 9:30 and the bus would get to the stop at 10 pm. Adding that to the one hour travel time and we’re now looking at 2 1/2 hours of travel time. If I took my car, it was 20-25 mins each way, for a total savings of an hour and 45 minutes. What’s my time worth? To me, the travel time did not justify the savings of the cost incurred of driving (mostly gas, parking is free on Sundays). If you incur a loan on a car, you will pay interest. However, you will also save travel time whenever you want to go anywhere. What’s the price of your time and freedom in the interim period of saving up for the purchase? Is the purchase of the thing that incurs the debt going up in value? If so, then the debt is worthwhile considering. Does it allow you to save time and effort compared to not having the purchase? Can you even use it to expand your income stream compared to not having it? If so, then what is the cost of financing the debt? Does the cost of financing save you time? Does it release cycles in your lifestyle (ie, free up your energy for other tasks)? In either case, there are some purchases that you will have to make. In this event, evaluation of the cost/benefit ratio is what needs to be done, rather than a blanket avoidance of debt. A few weeks ago, myself and my girlfriend were driving around Alki Beach. 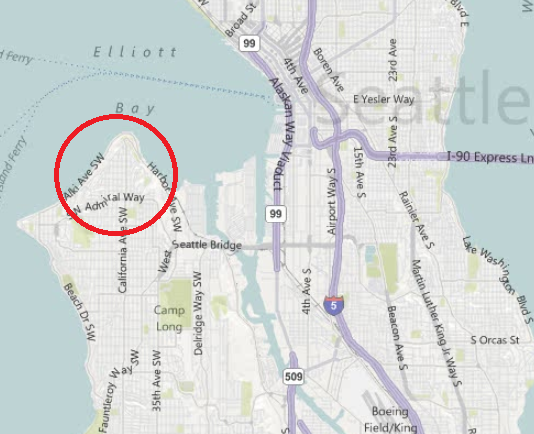 Alki is a general area in west Seattle. West Seattle, for those who are not local to the area, is an area of Seattle that is kind of a peninsula that sort of sticks out from the rest of the city. Prior to a couple of weeks ago, I had never been out there despite living in this city for three years. The area is a very nice area but it is a very expensive place to live. We looked at the house prices of a couple of places by Alki beach and they were in the neighborhood of $800,000. Ergo, I will never live at Alki beach. The problem is that some of the side streets are very narrow. We were driving around the more populated part of the town looking for a place to park when I pulled into a parking lot. It was kind of one of those small side parking lots behind a building that only has a limited number of spots. Anyhow, I pulled into the lot and looked for a place to park and decided that I didn’t want to park there. I pulled into a openish space and turned the wheel. I got out to inspect my car. It turns out that there is a noticeable dent on the underside of the bumper by the driver tire. It’s not big but it is evident. Not only that but some of the paint of the car is scraped away, and some of the yellow paint from the cement is there as well. My girlfriend advised me to not fix it because it’s not really drawing attention but it bugs me. I haven’t decided yet what I am going to do. I’ll probably get it fixed. Eventually. worried that my muscles are going to atrophy. days). I am doing this in order to ensure that my hip muscles stay strong. sure how much it is affecting my left hip. motion) are quite weak. This was made evident to me this past week. stretch, depending on how far you go down, it’s painful. better, but it’s not back to normal. If you pay any attention at all to politics in the United States, you will know that things are not looking too good for the Democratic Party. They currently hold control of the House, the Senate and the White House. They hold sizeable majorities in both houses of Congress. Yet as we get close to elections, things are not looking too good for them. If you read the polls at all, you will see various predictions and most of them point to the Republicans picking up control of Congress with a slight majority (but not as many as the Democrats currently have) and picking up a few seats in the Senate but not enough to regain control of it. It doesn’t take any serious prognostication to see this, all you need to do is check out Real Clear Politics or 538. This is a significant shift because it wasn’t too long ago that the Democrats picked up significant gains in the House (2006) and large seats in the Senate (60 in 2008). At the time, it looked as if the Republicans were going into a significant decline. First things first, let’s not get ahead of ourselves. While the Republicans are going to make significant gains and probably retake the House, it’s not because voters are particularly enamored of the Republican party. It is a matter of them being even more disillusioned with the Democratic party. The Republicans’ approval rating is not any higher than the Democrats but voters are prepared to punish the Democrats in the same way they punished the Republicans in 2006. Independent voters decide elections. Each party, Republican and Democrat, have core constituencies. Survey after survey suggests that there are more Democrats than Republicans in the United States by about 4% (ie, 35% to 31%). The rest are Independents who switch up their votes. The core constituencies are those that vote for their party every single time. Independents vote differently in each election and cannot be counted upon, and it is these voters that matter. In swing states (like Ohio and Florida), they decide elections. California always votes Democrat, and Texas always votes Republican. But when Independents throw their weight behind a particular candidate like they did for Obama in 2008, and for Democrats in 2006, the balance of power changes. Independents are uncomfortable with government spending. President Obama was elected on a theme of hope and change. Yet to Independents, they see more business as usual. Worse yet, with Democrat majorities every where, while under Republican President Bush the government was spending oodles of money, under Obama they are spending boatloads of money. One could argue that the Democrats inherited a weak economy and had to spend the money to stave off a depression, and one could also argue that under John McCain the Republicans would have done the same thing. But the flip side is that the economy got particularly bad in 2007 when the Democrats controlled the House and the Senate and did nothing to stem it back then, they’ve spent so much money already with no plans to abate in the future (and nothing to show for it), and therefore Independents will not sit by and watch the increase in spending continue. It is this swing of Independents support from Democrat to anyone-but-the-Democrats that has swung the balance in the GOP’s favor. The Tea Party is a player but not in the way you might think. To my Democrat friends, the Tea Party is a racist, anti-government bunch of rednecks who are the extreme right-wing of the Republican party. Actually, many Tea Party folks are those who normally vote Republican but those that sympathize with them and identify with them are usually quite representative of the population as a whole (excluding the far left wing of the Democratic party). Yet protest movements are not unusual in American politics. In 1992, Ross Perot captured 17% of the national vote. In 1996 he captured only half that much and most of that vote went to Clinton in his re-election year. The Republicans subsequently lost seats in 1998 and many independent voters punished them because of the way they handled the Lewinsky scandal. The point is that in 1992, a national Perot movement siphoned off Republican support which allowed the Democrats to gain, and in 1996/1998 they threw their support behind the Democrats. In 1994, they threw their support behind the Republicans and the Democrats lost the House. The point in all of this is that protest movements can swing politics. In the case of the Tea Party, they are protesting big government and they come from mostly the Republican party. Their protest is not necessarily aimed at the Democrats, but at big government. And they will punish the Republicans if they come to power and do not enact upon promises/ideologies of controlling government. Thus, these protests come and go… but they never actually go away. This one is as much a protest against both parties as it is against the Democratic party. That’s how I see things. Actually, it’s only a small lens of how I see things. As I said in my previous post, next week I am going to Vancouver for a conference for three days. I am planning to go up on Tuesday and then return Saturday night. But before returning, I shall catch a Canadian football game because my team is playing there. However, as I return late Saturday night, the very next day (Sunday) I am catching a flight to Washington, DC, for a 3-day conference there. This means that my total travel time is going to span 10 days. Not only that, but because of the useless internal travel portal that we have (worst portal ever), I will probably have to catch a 7 am flight. This means I will get back into Seattle at 1 am and then have to catch a 7 am flight, meaning I have to be at the airport by ~5:30 am. This means I have to leave my home at 5 am. And that means I have to be up at 4:40 am (I can shower and change fast). Next week in Vancouver, I am presenting a paper that I wrote entitled “The Psychology of Spamming.” I could have called “The Psychology of Scamming” but that would have never made it past the screeners who selected the paper. Essentially, the crux of the paper is why people fall for scams that are delivered via spam messages. This is not a technical paper. Instead, it goes into how our brains work, ties together emotion and then looks at how those types of things are exploited by spammers. I did a lot of research on this one and some of the hypotheses I had going into the paper did not hold when all was said and done. Indeed, I have an internal preview for it tomorrow and I am not ready for it. Just thinking about it now makes me very nervous. I’ve been thinking about incorporating a magic trick into this presentation, the way I do for almost every presentation that I ever do these days. I’ve known which one I wanted to do for a while, and this weekend I finally got around to building the props for it. Some of my favorite effects are tricks in which I build the props myself as I can customize them to my liking. The downside of this is that because of my inferior handiness, they usually don’t come out looking the way I want them to. The one I built this past weekend is an exception to this and it is passable. Here is the effect – I bring out four small blocks of wood about 4 square inches and 3/4” think. Sticking out of the center of one of them is a large nail. The nail is very real because I will take a piece of fruit on push it onto the nail, thus demonstrating its sharpness and danger. I then put all four blocks of wood, called bases, on the table and cover each one up with a Styrofoam cup. I have small pins in the bases into which to wedge the cups so they don’t fall off accidentally; they are held there by pressure. I then call a volunteer up on stage. The scene is this – there are four cups on the bases and beneath one of the cups is a nail sticking out of it. I ask the volunteer to turn around and kind of shield the cups from view while I mix around the cups. He then turns around and then we do the same thing except they mix the cups while my back is turned, shielding it from view. At this point, nobody knows under which cup lies the nail. I then take out four cards labeled 1 through 4 and place them in front of each cup, thus numbering the cups. Beneath one of them is the nail, but no one knows for sure which one it is. I then take out a blindfold and place it on myself and I ask the spectator to call out a number. Suppose he calls out 3. I then push block three forward, hold my hand over top of the Styrofoam cup, hold it there for a few seconds… and smash it down quickly crumpling the cup in the process. If he would have called out the wrong number, I legitimately would injure my hand quite severely and have to be taken to the hospital. I do this all in the name of entertainment and making a point. We repeat this one more time. The spectator calls out block 2. I push the cup forward, hold my hand over top of it… and smash it down on the cup. Once again my hand is intact. One more cup to go. The spectator calls out block 1. I push it forward and hover my hand over it. I give the spectator a chance to change his mind. He says no. I hover and hold my hand over cup 1 and prepare to slam it down. I hold my hand up and just as I slam it down I move it over top of cup 4 and slam that one down! The cup crumples and no nail has been impaled on my hand. I escape with no injury whatsoever! That’s the theory, anyhow. We’ll see how it works out in real life. The reason I do this is to illustrate a point. When emotions get involved in our decisions, they can interfere with logical decision making. Consider what I just described above. Would anyone really do something like that in real life, idly watch by while someone attempts to almost injure themselves? What about the emotional state of the spectator? They did everything I asked of them without protest and I did this by invoking a fear response along with some anxiety. By inducing fear, we become open to a more heightened state of suggestibility. I hypothesize that the fear response is at least part of the reason why we fall for scams. Furthermore, as humans, we don’t make judgments based upon the probability that something might occur, but only on the impact of it occurring. Thus, in my demonstration, while it may be unlikely that I get hurt because what they are seeing is a trick, it is the fact that I could get hurt and it would be pretty severe that impacts the decision making process.